Urban Simplicity: Crispy Bean Curd with Vegetables and Sweet and Spicy Peanut Sauce! 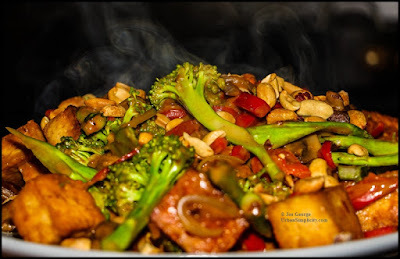 Crispy Bean Curd with Vegetables and Sweet and Spicy Peanut Sauce! I'll start this post with my recipe mantra...this recipe is so easy and so delicious and so nutritious. It really is all of those things, and I'm convinced even a person who says they don't like tofu will like this. But, yes if you must, you can add or substitute chicken for or with the bean curd. Remove the tofu from its package and drain it. Place the tofu between two plates, and allow it to rest there for 15 minutes to squeeze out excess water. Dice the tofu and heat the oil in a heavy skillet or wok. Carefully add the diced tofu to the hot oil and brown it on all sides. Then remove it to a plate lined with a paper towel. Carefully pour off half of the oil (save it for future use or discard it). Return the pan to the heat and add the mushrooms, tossing them in the pan or wok. When the mushrooms begin to brown, add the onions and peppers; cook them for a few minutes and then add the garlic and cook a minute longer. Add the broccoli, stirring it into the vegetables, then the ¼ cup of water. Stir the broccoli for a minute, then add the peanut sauce tossing and stirring everything together. 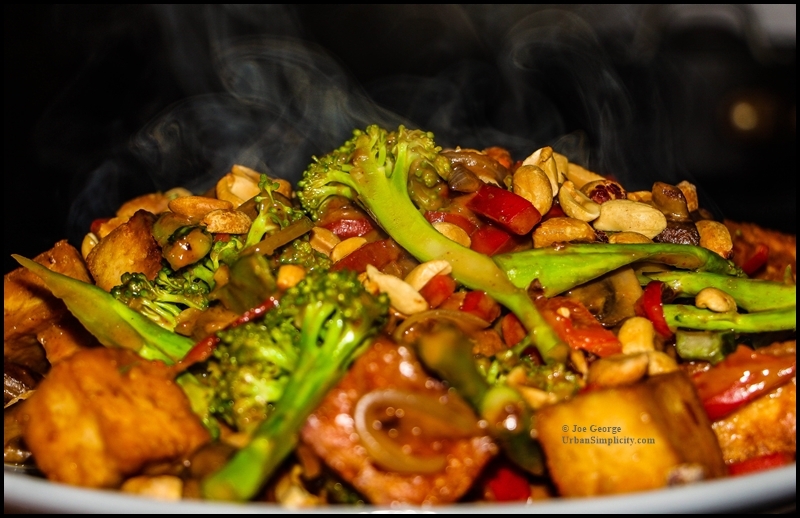 Transfer the stir fry to a large platter and garnish with the chopped peanuts. Serve with steamed rice. Stir everything together in a bowl until it is a smooth sauce. Cover and refrigerate until needed.